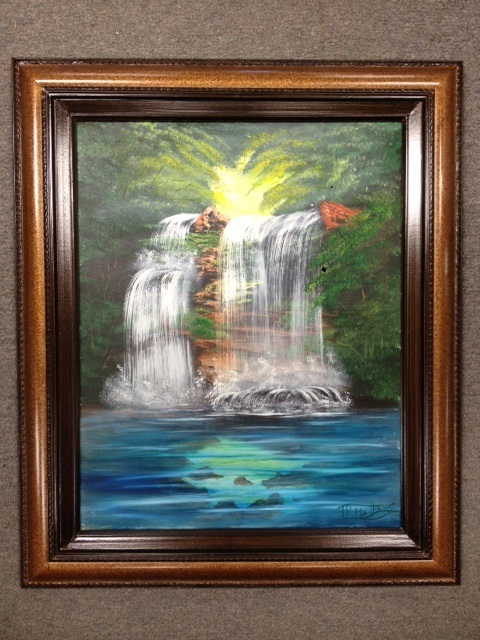 SO SORRY FOR ANY INCONVENIENCE……..
YOU can paint this beautiful Waterfall in our upcoming Bob Ross Painting Class to be held on Saturday, June 14, 9:00 A.M. here at the craft peddler. T.R. and Sandy will be here to show you how! This couple makes this mixed media painting so much fun….and you will go home filled with inspiration, and a great sense of accomplishment. Class fee is $75.00, with a down payment of $35 required at the time of sign-up. All supplies will be furnished (except the frame, which will also be available to purchase that day for a very reasonable price). We only have room for 10 in class, and there are already several signed up, so let me know ASAP if you would like to attend. There is a café in town, so during your hour break you can walk a half block to the “Chelle’s”, or you can also bring your lunch if you prefer, and eat here. And don’t worry if you’ve “never painted before”…. They teach newbies all the time, and every painting I’ve seen has been awesome. Please call 785-694-2817 or e-mail me @ craftpeddler@st-tel.net to sign up. graduations, family reunions, picnics, birthday, anniversaries, etc. etc., so its a great time to stock up on those. 16 beautiful colors from which to choose. DON’T MISS OUT ON THESE SAVINGS!!! SALE ENDS JUNE 30TH!